Kosher Tuna Fish Salad Tuna fish, fresh cross-cut celery, finely diced onion, in a seasoned mayonnaise dressing. Available in 5lb. Kosher Tuna Fish Light Tuna fish, fresh cross-cut celery, finely diced onion, in a 1/3 less fat seasoned mayonnaise dressing. Available in 5lb. Gourmet Albacore Tuna Salad White Albacore tuna fish, fresh cross-cut celery, finely diced onion, in a seasoned mayonnaise dressing. Available in 5lb. Gourmet Egg Salad Fresh hard-cooked eggs, finely minced fresh onions, and our specially seasoned mayonnaise dressing. Available in 5lb. New York Deli-Style Potato Salad Sliced Idaho potatoes, a classic deli dressing and just the right amount of onion. Available in 5 b., 10lb. and 30lb. size. Home-Style Potato Salad Cubed Idaho potatoes, fresh hard-cooked eggs, fresh red and green peppers, onions, in a thick creamy dressing. Available in 5lb., 10lb. and 30lb. size. 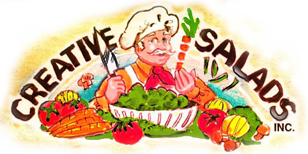 Classic German Potato Salad A must-have in any type of deli case, a sliced potato salad with a classic German brine served warm or cold. Available in 5lb. size. Home-Style Macaroni Salad The finest elbow macaroni, cross-cut celery, red and green peppers and a hint of onion in a creamy home-style dressing. Available in 5lb., 10lb. and 30lb. size. Classic Home-Style Coleslaw Freshly shredded green cabbage, carrots and a hint of red cabbage in a creamy mayonnaise dressing. Available in 5lb., 10lb. and 30lb. size. Health Salad (Clear Coleslaw) Freshly shredded green cabbage, carrots in a sweet & Sour Vinaigrette Dressing. Available in 5lb. Classic Cucumber Salad Thickly sliced cucumbers, sliced Spanish onions, fresh chopped scallions, in a sweet-and-sour vinaigrette dressing. Available 5 lb. size. Mushroom Salad Italiano Marinated button mushrooms, red peppers, red onion, fresh-cut celery, fresh garlic, parsley, in an Italian dressing. Available in 5 lb. size. Italian-Style Olive Salad Cracked Sicilian green olives, black Kalamata olives, oil-cured black olives, pepperoncini, marinated cauliflower, sliced carrots, red peppers, fresh-cut celery, fresh parsley, oregano, fresh garlic, in an Italian garlic and oil dressing. Available in 5 lb. size. Classic Beet Salad Sliced beets, sliced Spanish onions, in a sweet natural dressing. Available in 5lb. size. Tomato & Red Onion Salad Quartered fresh tomatoes, slices of red onions and garlic in an Italian dressing. Available in 5lb size. Carrot & Raisin Salad Freshly shredded California carrots, sun-ripened raisins, in a sweet mayonnaise dressing. Available in 5 lb. size. Deluxe Three-Bean Salad Red kidney beans, string beans and cannellini beans, fresh-cut celery, in a sweet-and-sour vinaigrette. Available in 5lb. size. Deluxe Four-Bean Salad Red kidney beans, string beans, cannellini beans, and chick peas, with fresh-cut celery, in a sweet-and-sour vinaigrette. Available in 5lb. Classic Corn Salad Whole kernel corn, red pepper strips, red onion, sliced black olives, in a sweet vinaigrette. Available in 5 lb. size. Chick Pea Salad Chick peas, red peppers, red onions, fresh cut celery fresh parsley, in light vinaigrette. Available in 5 lb. size. Kosher Marinated Grilled Mixed Vegetables Fresh-sliced eggplants, sliced yellow and green squash, button mushrooms, red and green peppers and sliced red onions grilled and marinated in a balsamic vinaigrette with fresh herbs and spices. Available in 5lb. size. Pasta with Broccoli Fresh-cooked rotelli pasta, blanched broccoli florets, fresh parsley, in a light garlic and oil dressing. Available in 5 lb. size. Kosher Sun-Dried Penne Pasta Penne pasta, freshly chopped basil, sun-dried tomatoes, fresh parsley, in a light Italian dressing. Available in 5 lb. size. Pesto Pasta Salad Fresh-cooked bow-tie pasta, garden fresh basil, fresh garlic, green peppers and roasted red peppers, in a fresh pesto sauce. Available in 5 lb. size. 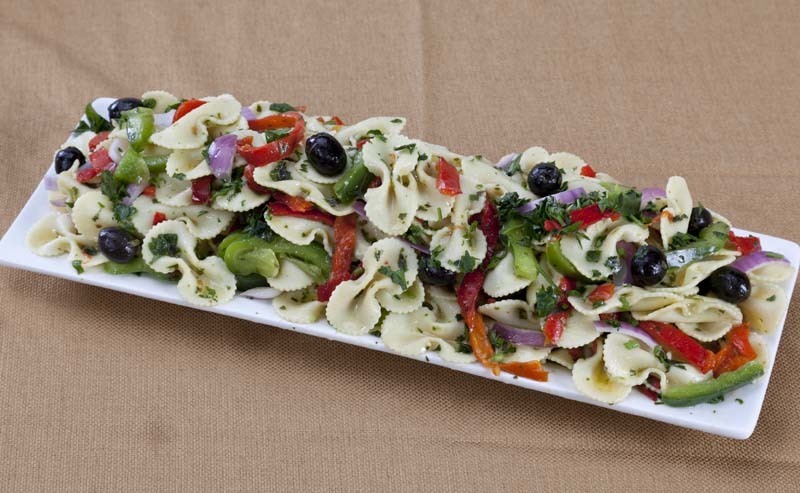 Pasta Supreme Freshly cooked rotelli pasta, fresh broccoli florets, roasted red peppers, black pitted olives, red onion, fresh parsley, in a light Italian vinaigrette. Available in 5 lb. size. Spinach Pasta Salad Freshly cooked bow-tie pasta, sautéed spinach, fresh garlic, in a light garlic and oil dressing. Available in 5 lb. size. Asian Sesame Noodle Linguine pasta, julienne cut carrots and peppers, snow peas, and sesame seeds in a sesame oil and honey soy sauce. Available In 5 lb Size. Vegetable Cream Cheese Spread Fresh-chopped scallions, freshly shredded carrots and chopped radishes whipped with cream cheese. Available in 5 lb. size. Apple Cinnamon Cream Cheese Spread Chopped stewed apples in syrup, cinnamon spice, brown sugar, whipped with cream cheese. Available in 5 lb. size. 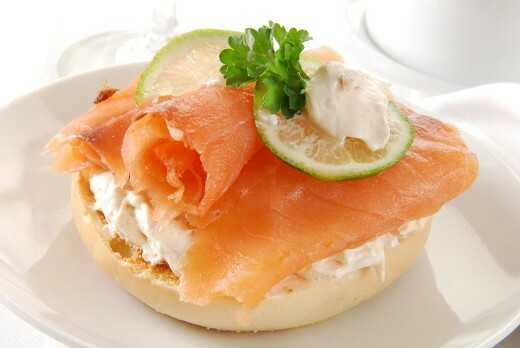 Lox & Cream Cheese Spread Fresh nova salmon chunks, ground nova salmon, whipped with cream cheese. Available 5lb size. Scallion Cream Chees Spread Fresh cut scallions, whipped with cream cheese. Available in 5 lb. size. Strawberry Cream Cheese Spread Fresh strawberries, strawberry syrup, sugar, whipped with cream cheese. Available in 5 lb. size. Walnuts & Cinnamon Rasin Cream Cheese Spread Chopped walnuts, raisins, cinnamon, brown sugar, whipped with cream cheese. Available in 5 lb. size. Olive Pimento Cream Cheese Spread Manzanilla olives, marinated pimentos, whipped with cream cheese. Available in 5 lb. size. Blueberry Cream Cheese Spread Fresh blueberries, blueberry syrup, sugar, whipped with cream cheese. Available in 5 lb. size. Bacon & Scallion Cream Cheese Spread Bacon bits (imitation), fresh chopped scallions, whipped with cream cheese. Available in 5 lb. size. Garlic & Herb Cream Cheese Spread Fresh chopped garlic, fresh mixed herbs, whipped with cream cheese. Available in 5 lb. size. Bacon & Herb Cream Cheese Spread Bacon Bits (imitation), Fresh Mixed Herbs, Whipped With Cream Cheese. Available In 5lb Size. Chocolate Chip Cream Cheese Spread Chocolate chips, chocolate syrup, whipped with cream cheese. Available in 5 lb. Plain Whipped Cream Cheese Spread Available in 5 lb.